During the almost 2,5 years you had opportunity to take part in almost 40 events of Soul Confectionery series. The last saturday of march is the last chance to come and enjoy the best groove with us! for the last party- we have a small surprise for you. You can go and pick up your invitations from Jazzga club and Pan Tu Nie Stal shop. the only thing you have to do is… to hurry up a bit- because the amount of the free entrance invitations is limited. One of the most energetic event during the whole Soul Confectionery series was the party with Ojciec Karol and Sushkin in the beginning of the last year. That is the reason that we decided to repeat the shutdown party with the same line-up playing! If you think – one of the most active funk dj crew in Poland – you definitely think – Break Da Funk. The core of the group is – Ojciec Karol, Benito and Spike, but beside them there are other people- musicians, painters, bboys involved in the project… Break Da Funk have released a 7 inch single record – „Tajniak”. The official premiere of the single was held in club 55 in Warsaw. Break Da Funk have their own radio programm as well in Radio Kampus 97,1 FM. 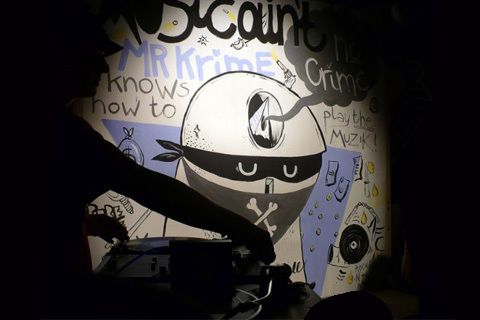 Break Da Funk is also a series of parties which were organized in one of the biggest clubs in Warsaw – club 55 (Culture Palace). During these events there were many great artists giving their show like 6ix Toys, Nostalgia 77, dj Format, Boca 45, dj Marc Hype & Jim Dunloop, Natural Self, The Broken Keys and many many others. This is not the end of attractions for the evening as we have also a specialist from the visual part of the event for this night. Ciah Ciah- who is a painter from Wrocław will show you live- how his masterpieces are made. For those who live in Łódź- for sure you have seen this huge painting covering the whole building on Lipowa street.